First awarded in 2009, the McKee Scholarship program is available thanks to the generosity of the late Hensel McKee, Washington ’30 and his wife Jeanette McKee. The Scholarship is available to undergraduate members and alumni members who are pursuing graduate degrees. To be eligible, applicants must have a cumulative grade point average of at least 3.0 on a 4.0 scale, be initiated members of Delta Sigma Phi Fraternity in good standing, and be enrolled at a college or university during the academic term. $10,000 each for men who are a well-rounded embodiment of Delta Sigma Phi values. $2,500 each for men who exhibit exceptional leadership. $2,500 each for men who have committed themselves to outstanding service to their communities. $2,500 each for men who have demonstrated exceptional academic performance. $2,500 each for graduate students of distinction. $500 each for undergraduate men exhibiting exceptional leadership and values. Delta Sigma Phi’s Executive Director & CEO, Patrick Jessee, will be resigning from his position at the end of 2018. We cannot thank him enough for his dedication, forward thinking, and drive for pursuing our mission of Building Better Men. Like other executive directors before Patrick, you don’t replace the person, but you do try to fill the shoes they wore. We are committed to finding an individual that can fulfill the responsibilities of this demanding role in a manner that continues to drive us toward our Vision 2025 goals. The executive search committee is actively seeking an empowered, progressive leader with a steadfast dedication to maintaining our member-focused, mission-driven organization. This individual should be collaborative, dedicated, and a staunch advocate for fraternity life. Interested candidates are encouraged to review the position profile available here. To be considered, qualified candidates must submit a resume and cover letter explaining their interest and fit for the position by July 15, 2018, to ExecApply@DeltaSig.org. We’re excited for Patrick as he pursues his next adventure. We know our next Executive Director is out there right now. The 2019 McKee Scholarship application is now available! Thanks to the contributions from the late Hensel McKee, Washington ’30, and his wife Jeanette McKee, the Delta Sigma Phi Foundation has awarded approximately $1,000,000 since 2009 to both undergraduate and graduate members. The McKee Scholarship awards scholarships based on leadership, service and academic achievement. 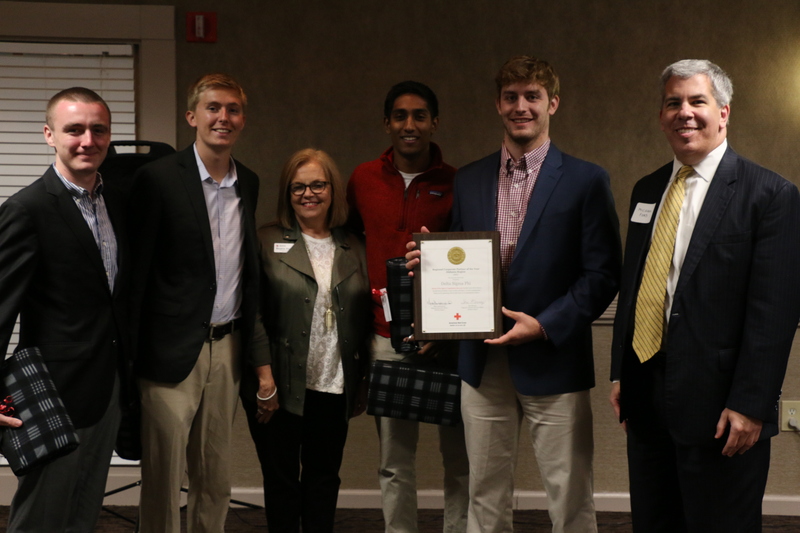 The Delta Sigma Phi Foundation will award up to $10,000 per individual scholarship recipient. To be eligible, applicants must have a cumulative grade point average of 3.0 on a 4.0 scale, be an initiated member of Delta Sigma Phi Fraternity in good standing and be enrolled at a college or university during the Fall 2019 term. The Better Man – Three, $10,000 scholarships awarded to brothers who exceed in the areas of Courage, Action and Excellence. Man of Courage Award – Twelve, $2,500 scholarships awarded to brothers who are bold in their actions in the face of adversity. Show principled leadership while embracing innovative change and advancement. This member stands as a pillar of strength for his fellow man; provides strong counsel, mentoring and advocacy. Man of Action Award – Twelve, $2,500 scholarships awarded to undergraduate members who are committed to service, loyalty and generosity. They are supportive to those in need, bring peace and unites the Fraternity with the needs of society. Man of Excellence Award – Twelve, $2,500 scholarships awarded to members who excel academically. These individuals are able to speak to their academic achievements; awards/scholarships, academic honors and long-term goals. Sphinx Scholarship – ­­­Twelve, $2,500 awarded to members of the Fraternity pursuing a graduate degree. Nile Scholarship – Twenty, $500 scholarships awarded to members who meet basic qualifications for the McKee Scholarship application. Should you be selected as a recipient, you will be asked to submit an official transcript and proof of enrollment for the Fall 2019 term. Please attach a print ready head shot (business dress, at least 1 MB). These photos will be used for press releases of award winners. Reviewers will not be able to view your photo during the grading process. Apply for the McKee Scholarship here. A: If you are a graduating senior and you are attending graduate school in the fall 2019 semester, you should apply for the Graduate Scholarship. A: Yes, but confirmation of completion will be needed prior to any awards being given. A: Yes, part-time students are eligible for the McKee Scholarship. A: No. Unfortunately, the McKee Scholarship is only open to those students who are pursuing undergraduate or graduate degrees. A: Yes, students who are studying abroad are still eligible for the 2019 McKee Scholarship. A: Yes, if you are a member in good standing, you are still eligible for the McKee Scholarship even if your chapter has been closed. A: Yes, past recipients are still eligible for the McKee Scholarship and may apply again. On behalf of the Delta Sigma Phi Foundation, we wish you the best of luck in earning the 2019 McKee Scholarship! Delta Sigma Phi would like to welcome Brittany Ankeny-Dooley as our new Assistant Director of Educational Programs. Brittany Ankeny-Dooley recently graduated from the University of North Texas with a Master’s in Higher Education and also holds a Bachelor of Science in Public Relations from Missouri State University. Prior to graduate school, she worked at the North-American Interfraternity Conference as a Coordinator of IFC Services where she supported and educated 250 Interfraternity Councils across the country. Before joining the NIC, Ankeny-Dooley served as a Leadership Consultant for her organization, Alpha Sigma Alpha Sorority. Brittany remains an active member of Alpha Sigma Alpha, serving as the Team Leader for the Sorority’s National Recruitment Revitalization Project Team and also serves as an NPC Non-Delegate Area Advisor. As Assistant Director of Educational Programs, Ankeny-Dooley will work alongside professional staff and volunteers to design curriculum and administer educational projects relevant to the organization’s strategic plan, including management of The LAMP, Delta Sigma Phi’s online learning platform, as well as our four premiere “brick and mortar” educational programs. Welcome! Divyesh Jevtani, Illinois State University ’01, has accepted an appointment as a member of the Delta Sigma Phi Grand Council, effective January 1, 2018. Brother Jevtani’s appointment fills a vacancy left by John Knowles, Western Michigan University ’99, who resigned effective December 31, 2017. “I reflect in awe of the experiences and cherished memories that will enrich my life forever because of Delta Sigma Phi, and am truly grateful.” said Knowles, on his 18+ years serving Delta Sigma Phi as a volunteer. Brother Jevtani serves as the Americas Region Communications Senior Manager for Deloitte and lives in the Greater New York City area. He brings strategic and operational communications expertise and a passion for Building Better Men to the Grand Council. His professional background will add to the Grand Council’s collective knowledge as the Fraternity continues to expand and enhance its channels for members to be engaged and to provide feedback and perspective on their fraternal experience. “Our vision is to develop strong leaders, build stronger chapters, and become America’s leading Fraternity,” said Patrick Jessee, Executive Director and CEO of Delta Sigma Phi. “We are excited to have Divyesh join the Grand Council, and see his Fraternity experience come full circle. Divyesh was an active undergraduate brother, serving on the Undergraduate Advisory Committee as the Central Region representative, attending national conventions, participating in several Regional Leadership Academies (RLAs), and graduating from our distinguished learning program – Leadership Institute. Not only was he able to take those experiences back to his chapter as an undergraduate, but he is now in a position to leverage his experiences and help us strengthen our Fraternity.” Brother Jevtani is also a founding member of the New York City Alumni Association and has volunteered at the Northeast RLA, The Summit, and Leadership Institute. Per the Constitution of Delta Sigma Phi, his appointment will run until August 2019 when the biennial Grand Council elections will be held at the Fraternity’s National Convention, to be held in Kansas City. You can learn more about Brother Jevtani on his LinkedIn profile. Delta Sigma Phi is pleased to share that Kristin Fouts will be joining the National Headquarters team on November 30, as Director of Educational Initiatives. Kristin has a wealth of experience with assessment and curriculum development. Kristin will be transitioning from the North American Interfraternity Conference, where she has lead the Coalition Assessment Project and assisted with the trade association’s educational programs. Prior to the NIC, Kristin worked in Student Leadership Engagement and F/S Life at Wichita State and Western Michigan University. Kristin joined the NIC staff in 2011 as the Director of the Fraternity & Sorority Coalition Assessment Project. Over three years she tripled the number of campus visits for the Project’s program review service. With the NIC’s transition in 2015, she assumed responsibility for educational program logistics, including recruiting, training and placing volunteers/Lead Facilitators and supporting campus hosts, coordinating the Annual Meeting and annual awards process, and collecting and managing industry-wide academic data and NIC member survey information. As Director of Educational Initiatives, Kristin will be overseeing the execution of the Fraternity’s educational framework, developing an organization wide strategy on data and assessment, and leading the Fraternity’s Transition Experience. This fall, 64 Delta Sigs will receive a helping hand from the Delta Sigma Phi Foundation when it comes to paying for their education. In July 2016, Delta Sigma Phi Foundation announced its 2016-2017 McKee Scholarship recipients. Since 2009, these scholarships have provided much-needed resources for brothers seeking either undergraduate or post-graduate degrees. These funds are made possible through will bequest to the Foundation from brother Hensel McKee, University of Washington ’30, which provided just over $4.3 million to the Foundation. 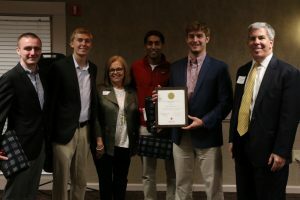 This year, the Foundation created new scholarship levels with differing dispersement amounts and tying the scholarships to Delta Sig’s ideals of being men of Courage, Action and Excellence. $10,000 each for men who for well-rounded embodiment of Delta Sigma Phi values. $500 for undergraduates exhibiting exceptional leadership and values. $2,500 for men who exhibit exceptional leadership. $2,500 for those who have committed themselves to outstanding service to their communities. $2,500 for men with exceptional academic performance. Beakie Powell of the West Alabama Chapter of the American Red Cross works closely with the men of the Beta Kappa chapter. The chapter was recently named the 2016 Corporate Partner of the Year. Chapter of the American Red Cross. They have support the Home Fire Campaign over the last two years, installing hundreds of smoke alarms into at risk home and providing important fire safety information to residents. Through their fundraising efforts they have donated over $20,000 to the local Red Cross chapter. Those funds support the mission of the Red Cross to help individuals in the face of disaster. The young men of Delta Sigma Phi have been wonderful to work with, each one is a gentleman with high moral character. Their group has given back to the community of Tuscaloosa with their time and respect. Cameron Carey, 2012 initiate of the Epsilon Iota chapter of Delta Sigma Phi at University of Wisconsin-La Crosse, has been recognized with the E. Allen James Outstanding Undergraduate Award. The award is named in honor of E. Allen James, North Carolina State ’65, whose service to the Fraternity has included executive director, member of the Grand Council, and president of the Delta Sigma Phi Foundation. Mr. James was present to bestow his namesake award to Carey. Carey graduated from the University of Wisconsin-La Crosse in 2016, and now serves as a chapter support specialist for Delta Sigma Phi’s national headquarters. $2,5oo for those who have committed themselves to outstanding service to their communities.